Mallow in Munster Club Intermediate Football Championship Semi Final..
On what is a huge occasion for the club, this weekend, our Intermediate Footballers will contest the Munster Club Championship semi final against An Ghaeltacht. A throw in time of 1pm next Sunday 12th November is sure to draw a packed house and we hope all in town will get behind our Cork County champions! As Sunday’s game is part of a double header with Nemo Rangers and Adare going head to head in the second game we would urge all those attending to either walk to the complex or get a lift just to help our stewards with parking. 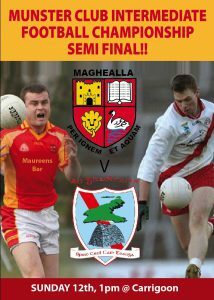 Please comply with stewards and Munster GAA officials, who are doing their best to ensure the day goes as planned.. A full carvery lunch will be provided in the club house a long with Tea/Coffee, Sandwiches, scones and refreshments.. We hope you all have a fantastic day.. Maghealla ABÚ..
Munster Club Intermediate Football Championship Semi Final Mallow V An Ghaeltacht, Sunday 12th November at 1pm in Carrigoon.. Please support..
U-14 Premier 2 Challenge Cup Semi Final Mallow V Carbery Rangers, Saturday 11th November at 230pm in Ovens..
Our annual Mass for deceased members will take place in the clubhouse on Thursday 16th November at 8pm. It will be celebrated by Fr. Corkery and Paddy Sheehan will provide the perfect musical accompaniment.. All are welcome.. The 2017-2018 Mallow GAA AGM will take place on Thursday 23rd November at 8pm in the club.. All members welcome..